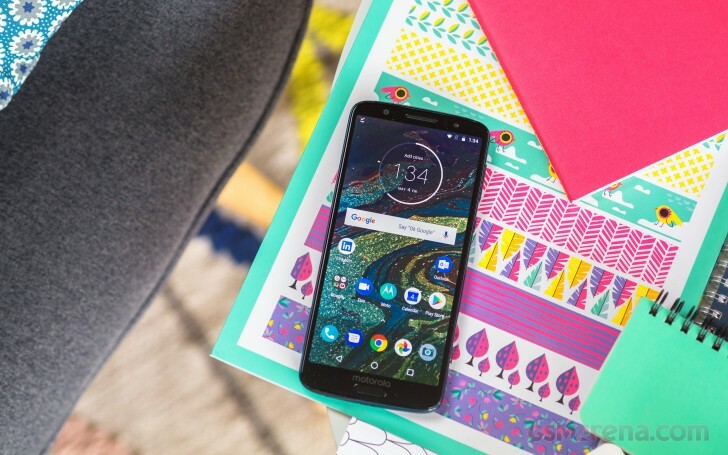 The Moto G6 brings an extra-tall display, in line with many of its competitors. These screens are an increasingly common sight and we expect them to stick. No notch on the Moto G6, thankfully. The Moto G6, just like the Moto G6 Play, packs a 5.7" IPS LCD with 18:9 aspect, only this time around it has more pixels - 1,080 x 2,160 or 424ppi - excellent for a budget phone. Under normal conditions, the screen's brightness tops off at 460 nits, with good enough contrast. Max Auto allows it to shine at up to 560 nits penalizing the contrast ratio a bit in the process. The Moto G6 scored a good mark on our sunlight legibility test - it means you shouldn't expect stellar visibility under strong sunlight, but it's usable in most cases. The color accuracy is surprisingly good if a few conditions are met. In its default mode, the entire screen has a distinct blue tint. The maximum deltaE sits at 6.9, with a maximum of 13.7 at point white. However, setting the color temperature from the default setting to Warm does yield tangible results. This way, you can get the color deviation down to a respectable average deltaE of 4.1 and a maximum of 8.1. The blue tint would be gone, and the colors are more pleasant looking. But in the end - it's what you prefer more - vibrant or accurate colors. At least you have the option to choose. There is a 3,000 mAh battery inside the Moto G6. The phone ships with a 15W Turbo Charger and it fills up from 0 to 43% of a depleted battery in 30 minutes, while it will take about 80 minutes for a full recharge. The Snapdragon 450 is a newer chipset manufactured at 14nm LPP process. We've seen it yield good battery numbers for the vivo v7 series, so we had hopes for the Moto G6. Unfortunately, the Moto G6 posted an endurance rating of 64h. That's a below average number for a 14nm chipset. The performance in all three tests - call, web, and video playback routines is quite promising, but there was a relatively higher power draw on standby. Our endurance rating denotes how long a single battery charge will last you if you use the Moto G6 for an hour each of telephony, web browsing, and video playback daily. We've established this usage pattern, so our battery results are comparable across devices in the most common day-to-day tasks. The battery testing procedure is described in detail in case you're interested in the nitty-gritties. You can also check out our complete battery test table, where you can see how all of the smartphones we've tested will compare under your own typical use. The Moto G6 has its earpiece double as a loudspeaker. But boy, is this thing loud! It might even be one of the loudest phones we've tested so far! The readings of our sound level meter put the G6 in the Excellent bracket, much like the G6 Plus before it. There's no distortion at maximum volume either, and the sound comes with deep bass and rich tones. Motorola Moto G6 did well with an active external amplifier, delivering output with excellent accuracy. Much like its Play and Plus siblings though, its loudness was below average for both this and the headphones test. Speaking of, when we plugged in our headphones, the G6 suffered a bit more than its peers in terms of stereo quality. The other readings were barely affected, though, which meant the overall output was still solid.